The countdown to school is on — or maybe your little ones are already in the swing of things. Wherever you and your family fall on the back-to-school spectrum, it’s the right time to consider adding one thing to the to-do list: a checkup and cleaning with your children’s dentist in Park Cities. Booking a visit during August puts little smiles on track for a healthy and successful school year. And there’s still time to schedule one for your child! If your son or daughter is like most, their smiles encountered a lot over June and July — like popsicles, ice cream, and all the other sweet treats summertime has to offer. Later bedtimes, sleepovers, and vacations can also lead to neglected oral hygiene habits. Add those two things together and it’s a recipe for trouble come time for summer’s end. Children are at a higher risk of tooth decay between the ages of 6 and 14 — so scheduling a checkup and cleaning before school begins is of the utmost importance for your little one. Visiting the dentist before school begins (or soon after the first day) isn’t much different from any other time of year. During any checkup and cleaning, plaque and tartar will be thoroughly removed from the surface of teeth and around the gums. Then, each of your child’s teeth will be inspected for evidence of tooth decay or weak spots of enamel. Sometimes, if these areas are detected early enough, they can be remineralized with a topical fluoride treatment to prevent the formation of a cavity altogether. If it’s too late for that, a quick tooth-colored filling can restore the area painlessly. When it comes to your child’s smile, prevention really is the best medicine. 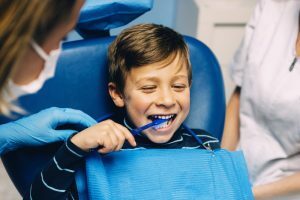 During the checkup and cleaning, your children’s dental team will look out for areas where they have may fallen down on the job brushing and flossing since their last visit. Helpful tips can assist your little one (and you!) to make sure that a great clean is achieved every single time. And now is the perfect time to get back on the “good oral hygiene” wagon! In addition to boning up on your child’s brushing and flossing techniques, try to incorporate these tips around your home to ensure the transition back to school (and back to good oral hygiene) are as easy as possible. Start adjusting to earlier bedtimes and wake up calls in the week before school begins. Be sure to leave plenty of time in the morning for proper brushing. While you are picking up school supplies, consider revamping your child’s oral hygiene tools, too (toothbrush, mouthwash, etc.). Start a progress chart to keep track of your little one’s brushing and flossing habits. Set small rewards for 2 weeks of cleaning properly. The first few weeks of school are an exciting time for most kids — so make sure yours is armed with a clean smile in addition to new school supplies by booking a visit with your children’s dentist! Dr. Allison Fowler is the Park Cities children’s dentist families and friends trust with their smiles, and she urges all parents to schedule their child a back-to-school checkup and cleaning this month. To book your little one’s visit, do not hesitate to get in touch by calling 214-368-0018.